UNO Libraries' Archives & Special Collections ensures UNO’s unique, rare, and specialized collections of institutional archives, personal papers, organizational records, rare books, and other material is available for public use. Visit Criss Library Archives & Special Collections to learn more about our collections and how to use them. The Arthur Paul Afghanistan Collection is one of the largest collections of Afghanistan research materials in the world. The Arthur Paul Afghanistan Collection Bibliography, Volume I: Pashto and Dari Titles (1995) and Arthur Paul Afghanistan Collection Bibliography - Volume II: English and European Languages (2000) are great resources when using the collection and are available online from DigitalCommons@UNO. The University Archives documents the history of UNO from the university's founding to the present. Official university records, personal papers, records of student and alumni organizations, photographs, memorabilia, and more is available. Material in Special Collections & Rare Books also includes unique and specialized items of local, state and regional interest in addition to a wide variety of materials in many subject areas and formats, including Omaha and Nebraska history, pre-19th century books, autographed books, rare first editions, fine arts presses, and other collecting areas. The U.S. Senator Chuck Hagel Archives include his legislative papers, artifacts, campaign records, and other material. Press & Media, Speeches, Videos, Artifacts, Grant Files, Photographs, and Schedules are open for research. The rest of the collection is closed while it is being arranged and described. Finding aids serve as guides to specific archival and manuscript collections. Finding aids are also often thought of as inventories to collections. Archives & Special Collections' finding aids database provides finding aids for researchers to search or browse. The database was launched in September 2014 and finding aids for collections will continue to be added. Researchers will note finding aids for material from University Archives, Special Collections, and the Arthur Paul Afghanistan Collection in the Archives & Special Collections' finding aids database. If you have not found what you are looking for in the database contact staff in Archives & Special Collections for assistance. Archives & Special Collections' books, theses, and dissertations can be found by searching Criss Library's catalog. Other selected material in Archives & Special Collections that can also be found in the library catalog includes periodicals, some maps, and some audiovisual material. Criss Library's catalog indexes books, CD's, DVD's, musical scores, maps, government documents, theses and dissertations, as well as other material available in the library outside of Archives & Special Collections. The Arthur Paul Afghanistan Collection Bibliography, Volume I: Pashto and Dari Titles (1995) and Arthur Paul Afghanistan Collection Bibliography - Volume II: English and European Languages (2000) are available online from DigitalCommons@UNO. The UNO Criss Library Archives & Special Collections collects, preserves, and makes available to the university community and the public unique, rare, and specialized material. This includes personal papers, organizational records, books, maps, ephemera, and other material in selected subject areas including the Arthur Paul Afghanistan Collection, University Archives, U.S. Senator Chuck Hagel Archives, and Special Collections & Rare Books. You can learn more about finding and using material in Criss Library Archives & Special Collections online and we encourage you to contact us about your research. Whether you're working on a paper for a class, producing a film, writing a book, planning a retirement celebration for a UNO colleague, or researching a campus history project, Archives & Special Collections has the resources for your project. We are also able to host classes in Archives & Special Collections, visit your classroom, and offer tours for groups. 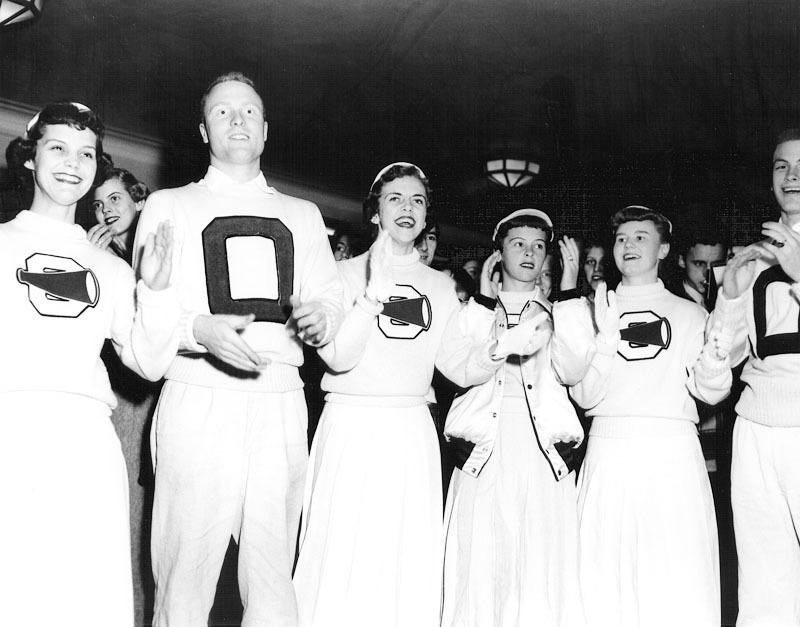 OU cheerleaders sending off the football team to the Tangerine Bowl, December 1954.
Credit: UNO Photograph Collection, Archives & Special Collections, Dr. C.C. and Mabel L. Criss Library, University of Nebraska at Omaha.